It's been a long week at work seeing out the last few performances of "When the Rain stops Falling" so I needed a bit of time away from the inner city and the dark angst of the theatre. 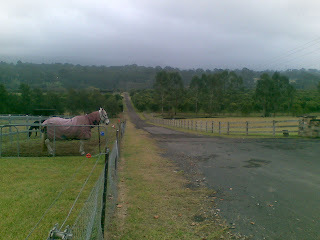 We went orange picking at Penrith Valley - that's the groves in the distance with the mist-covered Blue Mountains in the background and a very cosy horse on the side. 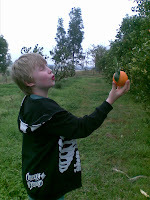 We picked and ate lots of juicy oranges and took enough home to ward off colds and flu, and to make some Marmalade. I had to return to the city that night unfortunately but I felt a bit refreshed and cheered by the fresh air and green fields. 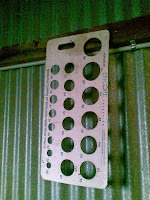 In the packing shed this object was hanging on the wall and it was immediately labelled as the world's largest Knitting Needle Gauge. I think we need to get out more. Sounds lovely. I would have thought it was a ginormous knitting gauge. Why? What else can it be? Glad you had a chance to get some clear [and crisp] air - we missed you on Saturday! And yes, it does look like a needle gauge!